When you take multiple glucose tests in a short amount of time, the test results often vary. Here's why: If your actual glucose level at the time of testing your glucose levels is 103, for example, then the meter will give you a reading range that's up to plus or minus 10 Mg/dl (in the case of a 103 glucose level, the range would be 93 to 113). Also, if the readings are taken from different fingers, the change in the fluids between the finger regions fluctuate, which can also result in varying test results. Additionally, it's important to wash your hands and have a clean area because skin contaminates can affect the results. Finally, blood glucose changes rapidly, so if you test a few minutes apart, you can get different results. 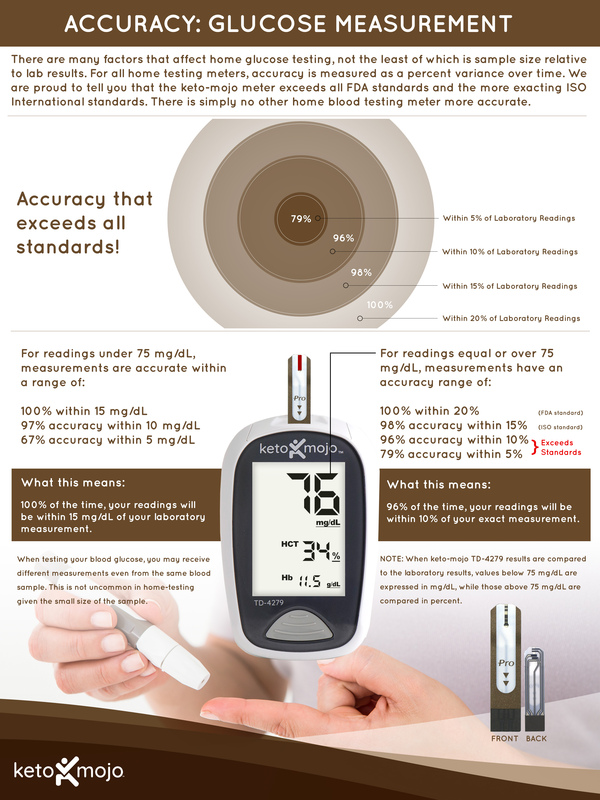 Factors Affecting Blood Glucose Monitoring: Sources of Errors in Measurement by Barry H. Ginsberg, M.D., Ph.D.
What are the different blood glucose testing measurements on the Keto-Mojo meter and what do they mean?